The story of Tonya Harding – the one-time US figure-skating champion who fell from grace spectacularly after her involvement (the extent of which is still hotly disputed) in the deliberate maiming of her competitor, Nancy Kerrigan – is one that seems ripe for adaptation. Coming from a working class background in Portland, Oregon, with an abusive mother and husband (the wonderfully named Jeff Gillooly), she was, for a time, the most promising star in world figure-skating. Her unpolished style clashed with the snobbish skating establishment – which made no bones about her ‘unsuitability’ – but her natural talent and skill was undeniable; no more so than when she became the first American to land the ‘triple axel’ (a notoriously difficult and widely feared skill) in competition. That the Nancy Kerrigan Incident only seemed to confirm the skating establishment’s fears about her and end her career, then, seems a special kind of tragedy, and one undoubtedly worth exploring. Directed by Craig Gillespie and starring Margot Robbie in the titular role, I, Tonya has all the stylistic trappings of a Goodfellas-style journey through the rise and fall of a real life figure. The film begins in her childhood, as her mother (played hawkishly by Allison Janney) first begins making her ice-skate. Her mother’s abusive nature is left unambiguous – not letting Tonya leave the rink until she wets herself, physically abusing her, and at one point even throwing a knife at Tonya that lodges itself in her arm. Tonya’s abuse only continues as she moves in with her soon-to-be-husband Gillooly (played by the unengaging Sebastien Smith), who reveals himself to be just as horrible and violent as her mother, though a lot more pathetic. It’s Gillooly, the film argues, who is really to blame for Tonya’s downfall; his misguided attempts at reconciliation are what kick-starts the chain of events that eventually leads to Tonya’s overweight and moronic ‘bodyguard’ hiring two people to ‘disable’ Kerrigan. However, the film’s characterisation of Harding as a plucky and serially unlucky victim of fate comes off as more than a little disingenuous. While an ostensibly sympathetic rendition of her story, the film never misses a chance to snigger at her working class affects or lack of poise. It even begins with a title card saying ‘based on the irony-free interviews… [of Harding and co.]’ – the implication being, I suppose, that if only these dunces had a bit of self-awareness they might see the funny side too. In fact, most of the abuse we’re shown is played for laughs rather than pathos; we’re never really given a sense of how such abuse shaped or distorted her world-class skating abilities. And it’s a problem because the events it’s based on are tragic more than anything. The real Harding really does seem a victim of a tough upbringing and unfortunate relationships with horrible people. That she, in spite of all this, became one of the world’s best is truly awe-inspiring, and while the film pays credence to this idea, it’s frustratingly flippant about it. I’m also not convinced yet, as it seems many are, of Robbie as A Great Actress, but I don’t think she’s helped here by a script that asks surprisingly little of her. She’s certainly committed, but the film seems hesitant to say anything about Harding any deeper or more complex than, ‘What an injustice!’ When the dénouement skirts around the true heartbreak of her never being able to skate again by suggesting that, oh well, she won’t give up!, it’s another example of the film’s surprisingly blasé attitude towards the actually pretty depressing events it depicts. It seems, in fact, like another attempt to avoid dealing with the deeper tragedy of Tonya Harding’s life on any meaningful level. This lack of care or consideration seeps into all the performances to some extent; no-one is bad – although the aforementioned Sebastian Smith is uniquely uninteresting – but the film’s refusal to truly engage with the uncomfortable realities of its story means the actors are under-served. Rumours of Oscar-worthy performances are greatly exaggerated, to say the least. Structurally and stylistically, too, the film also has issues. A series of interviews with the players involved, which regularly break up the action to offer colourful – and conflicting – insights, is the framing device around which the film is based, and it’s a major misstep. The film is far too beholden to narrative tricks, tics and devices, often at the expense of the narrative it’s trying to tell. The aforementioned interviews, for instance, offer very little to the story in real terms, more often serving as punch lines or counterpoints to the goings on of the film. But not merely content with the interviews as a narrative frame, the film also features a voice-over by Robbie, and, most confusingly, a distracting habit of having different characters regularly break the fourth wall. Now any of those features are, in and of themselves, fine and often helpful narrative devices, but when all used together, and so inconsistently as they are here, it makes the film feel overstuffed and stylistically confused. It is almost visibly straining to achieve a Goodfella’s level of kinetic and fluid style, yet either through directorial inability or a misunderstanding of how to effectively portray Harding’s story (or, more likely, both) the film comes off as a weak imitation. This isn’t helped any further by the soundtrack, enjoyment of which is, of course, subjective, but at the same time is so overbearing and obvious as to become actively annoying and distracting (having Dire Strait’s Romeo And Juliet play as romance begins and Fleetwood Mac’s The Chain start as a situation slowly grows more intense and out of control seems, to me, the laziest and most unimaginative cinematic shorthand possible). But it’s symptomatic of a film trying its very hardest to mimic the propulsive and compelling style of Scorcese’s best biopics, and falling short. 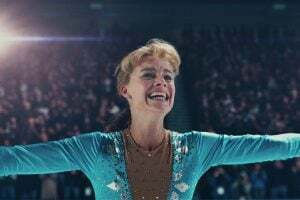 So it’s disappointing, then, that the biopic seems only interested in exploring only the very surface level elements of her story, more concerned with flash and style – its supposedly sympathetic take on the events tinged with an undercurrent of condescension towards Tonya herself. It feels like such a frustrating waste because, for all her faults, Tonya Harding is an extraordinary person and, for better or worse, the Nancy Kerrigan Incident is an extraordinary story, and it’s one that deserved much better. Directed by Craig Gillespie and starring Margot Robbie in the titular role, I, Tonya has all the stylistic trappings of a Goodfellas-style journey through the rise and fall of a real life figure. However, the film’s characterisation of Harding as a plucky and serially unlucky victim of fate comes off as more than a little disingenuous. The film is far too beholden to narrative tricks, tics and devices, often at the expense of the narrative it’s trying to tell.